The PowerVR GX6250 from Imagination Technologies is a mobile graphics card for ARM based SoCs. It is usually used in Android based laptops and smartphones. It was first announced in the MediaTek MT8173 in mid 2014. The performance should be in the higher middle class of mobile GPUs. 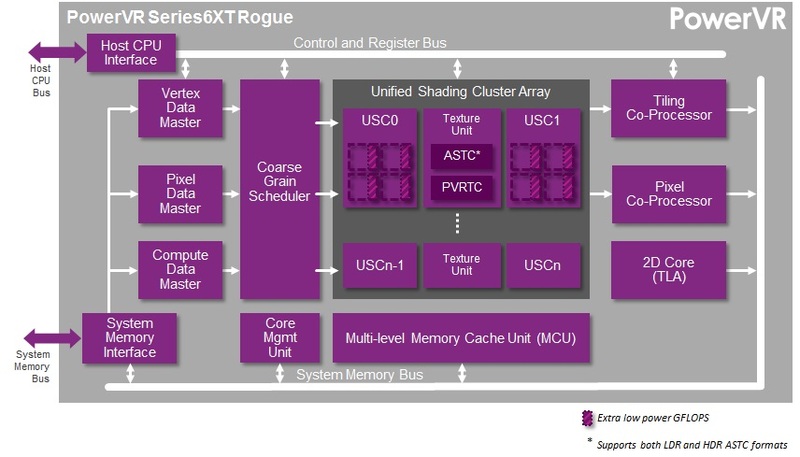 The graphics card is part of the series 6XT (Rogue) of GPUs and offers a unified shader architecture with two clusters, two TMUs and 32 FP32-ALUs. The GPU supports OpenGL 3.x/4.x, OpenGL ES 3.x and DirectX 10. In the MT8173 the GPU is clocked at 700 MHz and therefore the performance should be similar to the Adreno 330. Therefore, even demanding games of 2014 should run fluently.